One of the most powerful live acts on the British world music scene on their visit to Ipswich - an opportunity for any Suffolk resident not to be missed! The concert was arranged by the local agency Peppery Productions, and took place in Ipswich's Manor Ballroom. Is there any better way to start an evening with hot Indian music than with a hot Indian curry in a curry house just around the corner from the venue? Apparently not many thought so, as the curryhouse was very quite that evening... while the concert turned out to be packed! Having become used to English folk club concerts, it was rather inspiring to visit a concert with a young enthusiastic audience. Another difference to a folk club - live music started only an hour after the official starting time, and instead of support acts, the time between 8 and 9 was used for warming up the audience with "canned" world music. 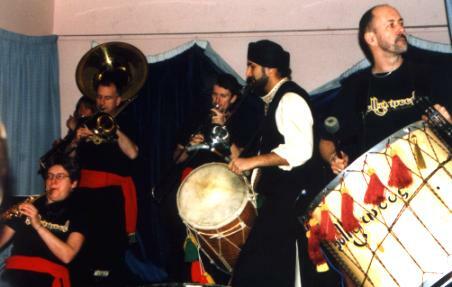 When shortly after 9 the Bollywood Brass Band came onto stage, it did not take long to transfer the ballroom into a hot music club, with a wild dancing audience. I have to say, if I had not seen the band before at a festival, I would not even have considered to go to the concert - I have to admit that somehow traditional Indian music and me do not really go together. The Bollywood Brass Band however does not play traditional Indian music, but take up a tradition that has started in India during the last couple of centuries. There have been wedding and procession bands in India since the 19th century, which originally consisted of shanai (a double reed instrument) and percussion. As more Indians were trained in the British military and were introduced to English marching band traditions, more and more bands started to add clarinets and brass instruments to the line-up. Today there are hundreds of brass bands across India. The widest exposure of this music has been through Indian "Bollywood" film productions, where this kind of Bollywood music acts not only as a sound track, but as a part of the whole piece of art that the films represent. However, the Bollywood Brass Band is, to some extent, also different from the original Indian brass bands, because most band members do not have any Indian music background, being based in London. As they state themselves, the musicians were "somewhat surprised to find they'd become an Indian wedding brass band". They started off as a world music street band, Crocodile Style, until they were asked to join a Diwali procession and learnt some tunes from the Shyam Brass Band. 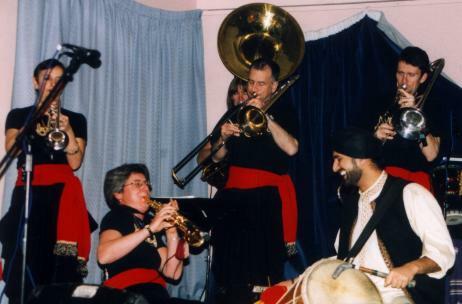 Soon the band, augmented by some new members, became the Bollywood Brass Band, playing mainly at weddings and other community events. And a bit later they started to play festival gigs, with tremendous international success. The Ipswich gig went on for several hours, and a brilliant concert it was indeed. I was not sure before I went to the concert whether the music might be getting a bit much for a full concert, having seen them before in a shorter set on the German Rudolstadt Festival. But definitely not - this is a band that will entertain you for hours! A"must see" for anybody who likes brass music.